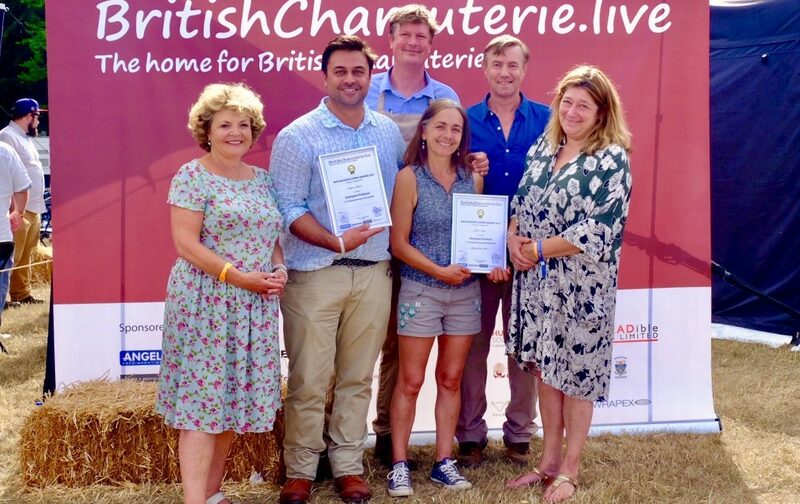 The British Charcuterie Awards, organised by BritishCharcuterie Live, were held for the first time in August 2018 at BBC Countryfile Live. “British charcuterie is showing such dynamic development, we felt the time was right for all producers, artisanal or larger-scale, to have an appropriate public showcase for their diverse ranges,” says co-founder of the awards Henrietta Green, originator of the FoodLovers movement, food consultant, food writer, and one of the leading authorities on British local and regional speciality foods. Farmers, butchers, meat processors and chefs competed in nine different classes at the awards. These range from air-dried & ready-to-eat whole muscle to native and heritage products with a Champion of Champions Product and Champion of Champions Producer selected from the nine classes. MasterChef 2010 winner, Dhruv Baker and MasterChef runner up 2011 and Thomas Whitaker of Tempus Foods were judged Champion Producer for their pork products – Smoked Jowl, Spiced Loin, Smoked Coppa and House Salami. The award for Champion Product went to Phil and Melissa Beal of Beal’s Farm for their Mangalitza Ham in a well-contested competition to find Britain’s best Charcuterie Producers held yesterday (2nd August). Tempus Foods and Beal’s Farm took part in the inaugural BritishCharcuterie Awards, the first ever national awards celebrating the meteoric rise of British Charcuterie production, co-founded by Henrietta Green and Charlotte Sharpe-Neil. 432 products made by nearly 100 British charcuterie producers were tasted and judged over nine classes by 33 expert judges, who also selected the two Champions based on their scores across nine different classes. The judging took place at BBC Countryfile Live, at Blenheim Palace on 2nd August within The BritishCharcuterie Tent which is open to charcuterie-lovers throughout BBC Countryfile Live. The competition covered British charcuterie made by butchers, farmers, chefs, artisanal and larger-scale charcuterie makers, using pork, lamb, beef, venison, duck, poultry or game. There were some 40 entries which use meat only from rare and native breeds and some excellent heritage entries included Haslet, white puddings and Lincolnshire Chine. Over 200 gold, silver and bronze awards were given, reflecting the exceptionally high standards of the products entered. The live, blind judging was undertaken by 33 leading food, retail and hospitality experts including Head Judge John Gower, a judge at New York’s Charcuterie Masters; British Bake Off co-judge Prue Leith; Chefs Chris Galvin, James Lowe, Russell Norman, Adam Handling and Neil Borthwick; master butcher David Lidgate; Rich Summers of The School of Artisan Food; food writers Xanthe Clay and Felicity Cloake; Graham Stoodley Charcuterie Manager for Harvey & Brockless, Shane Holland of Slow Food UK and Nicole Lander of the Rare Breeds Survival Trust. Judging was carried out blind and points were awarded for presentation, aroma, feel, eating qualities – front flavours, texture and length of/back flavours and finally for innovation and/or excellence with a maximum score of 100 points for a product. A Bronze Medal was awarded for all products scoring between 60-70 points, Silver Medal for all products scoring between 70-80 points and Gold for all products scoring between 80-100 points.